In rocks glass, mix club soda, rum and grenadine. 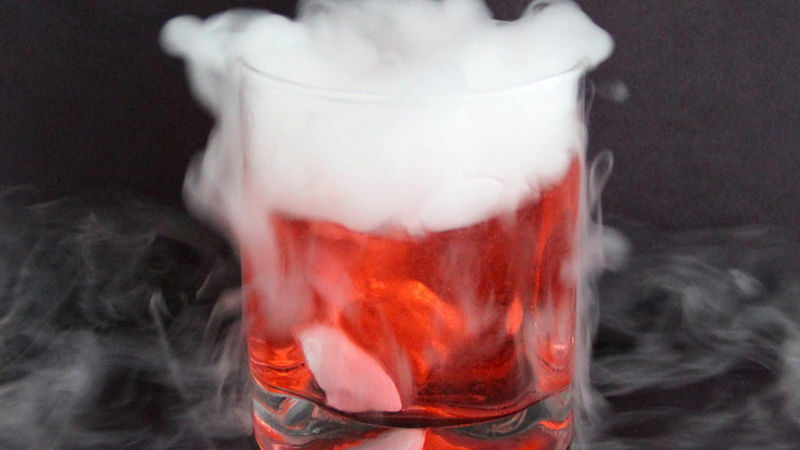 With tongs, add food grade dry ice to glass. Serve immediately. Two forms of dry ice are available, commercial, which usually has added chemicals, and food grade, which is just CO2. Use food grade dry ice for this recipe. Caution guests to not drink or eat the dry ice. It will stay in the bottom of the glass, so it is easy to avoid. An ice cube-size chunk will bubble and smoke for about 5 minutes. Dry ice is sold in blocks. The easiest way to chip it apart is with a hammer and screwdriver while wearing safety glasses. With these tools, the ice evenly separates into square cubes. Use caution when handling dry ice and keep it away from children. Get inspired by different types of colored liqueurs—try blue curacao or green melon liqueur.